On Wednesday, March 1, the Isenberg School of Management’s Berthiaume Center for Entrepreneurship hosted their Innovation Challenge: Semi-Final round, the third of four total events. Twelve teams of students, or “ventures,” presented their original product concepts to a panel of entrepreneurs, legal experts and consultants, who then select five to seven finalists to compete in April. This year, one venture, named “Fireflight,” offered the idea to assist first responders in surveying dangerous environments. It’s a software that allows users to view through cameras on drones and firefighters, as well as their locations on a map. Fireflight—designed by Roy Chan, a graduate student studying computer science, senior Nicolas Duenas, a civil engineering major, and junior Bryan Chua, a chemical engineering major—runs through an augmented reality simulator like a Vive or an Oculus product. Molly O’Mara, who works at Isenberg’s Berthiaume Center for Entrepreneurship in communications, events and constituent relations, explained how the event operates: In the annual Innovation Challenge, students compete in four events spread over the academic year, two short pitch competitions, one boardroom simulation and the “final shark tank.” Seed money is awarded to the best teams at each event, giving a head start toward funding their pitched goods and services. At the end of the final round, over $80,000 will have been granted among the teams. Birton Cowden, director of new ventures at the Berthiaume Center, assists students in conceptualizing new ideas and executing their working business plans. In last year’s challenge, a venture called “Aclarity” took first place at the finals. Cowden detailed their “unique water utilization technology.” Today, the students behind it, Julie Mullen and Barrett Mully, are potentially working with a billion-dollar company to expand their idea. 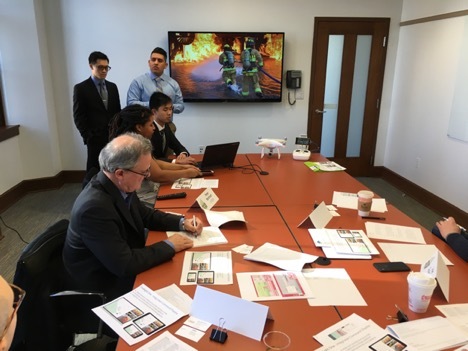 The Innovation Challenge can also provide benefits beyond prize money and bragging rights: Fireflight is in works of partnering the Springfield Fire Department with one of their own classes at Isenberg, forging new paths between UMass and the state.